California's new Mojave National Preserve, touted as "a park for the 21st century," seeks to remain primitive and to avoid alienating the small communities in and around the preserve. Garfield County Commissioner Louise Liston in her own words on her fight against the monument and her struggle to preserve what she sees as important in the region. 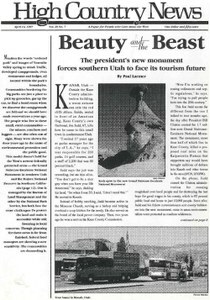 Roger Holland, a Kanab town councilman, in his own words on why he hates the new national monument. Gerry Rankin, mayor of Big Water, Utah, in her own words describes her town's high hopes for Andalex's mine, but says she is willing to work with the new situation the new monument is bringing. Jerry Freeman, owner of the tiny town of Nipton, Calif., in his own words on why he thinks the preserve will be a good - and profitable - thing. Rancher Rob Blair in his own words on why he intends to keep raising cattle on the Mojave Preserve. An elegy for Yellowstone's "geyser guy," Rick Hutchinson, profiles a geologist who loved the park so deeply that his friends still feel his spirit there. A conference, To Cherish and Renew: Restoring Western Ecosystems and Communities, in Salt Lake City, Utah, April 17-19. The 19th Desert Conference, at Oregon's Malheur Field Station, April 24-27. A new comic book called "Tribal Force" wants to offer positive role models as well as entertainment to young Native Americans. A film called "The Burning Barrel," intended for PBS, offers a nostalgic portrait of a South Dakota childhood and a grim view of the present. "Seeing and Being Seen: Tourism in the American West" conference to be put on by the Center of the American West at the University of Colorado, Boulder, May 1-2. A report titled "The Information Dirt Road" says that rural areas such as western Colorado are being shortchanged by the deregulation of telecommunications. Science fair project on condoms; nudists worry about neighbors in Ariz.; Moab's concern about teens on slickrock; "genital broke" horse; pet psychic fair in Scottsdale, Ariz.; Yellowstone bison slaughter; ADC helps rich folks in N.M.; workout hints. The Supreme Court rules that people can use the Endangered Species Act to sue the feds for protecting species too much, as enviros use it to sue for protecting species too little - and those on both sides seem pleased by the changes. A federal judge orders the U.S. Fish and Wildlife Service to list four Southwestern species as endangered and to set aside habitat for them and two others already listed. Utah politicians, angry at actor Robert Redford's support of the controversial new Grand Staircase-Escalante National Monument, pass a resolution to turn Redford's Sundance resort into a wilderness. A survey of soft money focuses on Colorado billionaire Philip Anschutz and his generosity to the Republican party. California scientists say air pollution from the San Joaquin Valley is killing thousands of trees in the Sierra Nevadas. People burning old industrial-gauge wire in the Utah desert to get at the raw copper left to sell are breaking the law and creating a serious health hazard, BLM officials warn.